At one end of the storage spectrum is fast and flashy SSD storage and at the other – still – is tape; streaming ribbons of rust that are cheaper and more reliable than disk, and still selling for on-premises and off-site archive data storage. Scalar i3 – a 12U box with up to 3PB capacity. Scalar i6 – a rack device storing from 750TB to more than 12PB (4.8PB uncompressed). The libraries support LTO-6 and LTO-7 format tapes and have 8Gbit/s Fibre Channel host interfaces, with the i3 also supporting 6Gbit/s SAS. There are 2 x 10GbitE management interface ports. Proactive diagnostics help resolve issues before they affect operations. These libraries have embedded compute capabilities to eliminate the need for external application servers. What does this mean? The new Scalar line has an all-new HTTP-based interface; automated setup, configuration and management tasks via web services; an intuitive, swipe-based local user interface design; and interaction via mobile devices. The system supports a maximum of 12 drives with from 25 to 200 slots, providing compressed capacities from 375TB up to 3PB. 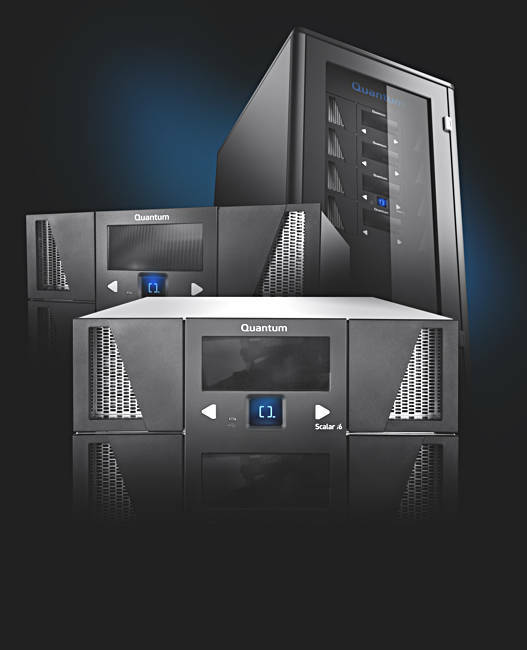 There is a partitioning feature so the Scalar i3 can provide both data protection and archiving. Quantum says its i6 has the highest storage density of any tape library. An Extended Data Life Management (EDLM) feature provides policy-based integrity checking. It lets users set a tape-scanning policy and "rely on the system to identify degraded tape conditions and subsequently trigger both the movement of files to a new tape and the updating of metadata." The system's "Active Vault feature allows cold data to be vaulted inside the library at an even lower cost-per-GB, minimizing cartridge handling while improving security and access to vaulted content." A Scalar i6 module supports up to three full-height LTO tape drives and 100 storage slots, for up to 1.5PB of storage per module. There is one controller module and 7 expansion modules in a full rack system. A full i6 rack has a maximum of 800 slots and 24 drives. This is the i6 combined with StorNext data management software for media workflow use. It has policy-based tiering to give users transparent file system access to data stored on tape, and is self-healing with automatic migration capabilities (using EDLM) to ensure ongoing accessibility of content. The StorNext AEL6 is available with capacity-on-demand slot-based licensing to facilitate incremental and immediate scaling of the system to accommodate business growth.